Rehearsals for NIC’s production of Twelfth Night are in the finishing stages. Practicing their parts are, from left: Logan Parks, of Soldotna, AK (playing Antonio), Annika Holmes, of Athol (an officer), Travis Cook, of Athol (a servant), Zach Johnston, of Athol (Sebastian), and Jessica Sylvia-Clarno, of McCall (Viola). 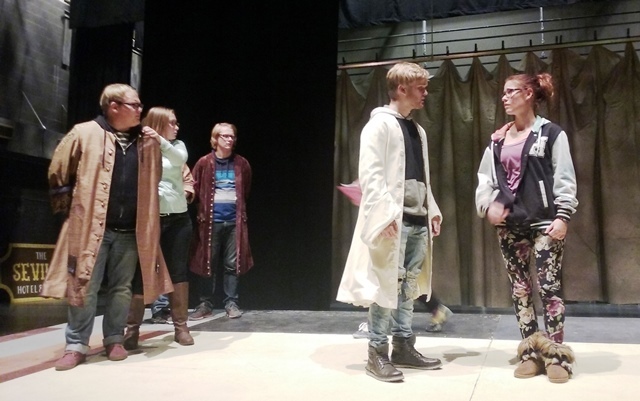 The North Idaho College Theatre Department presents “Twelfth Night, or What You Will” at 7:30 p.m. Oct. 20-22 and Oct. 27-29 in NIC’s Boswell Hall Schuler Performing Arts Center on NIC’s main campus. “Twelfth Night, or What You Will” was written by William Shakespeare. Viola and her twin brother, Sebastian, are shipwrecked on the island of Illyria. Each thinks the other is drowned. Viola, disguised as a man, ends up in the court of Duke Orsino, who is hopelessly in love with Olivia. In Olivia’s house is her raucous cousin, Sir Toby, whose dimwitted friend, Sir Andrew, is also in love with Olivia. Trying to keep the noisy guests in line is the puritanical Malvolio, who is himself in love with Olivia. Orsino sends Viola to woo Olivia on his behalf, but she is in love with Orsino. From apparently tragic beginnings, Shakespeare crafts a bawdy, energetic comedy that has become an audience favorite. The cast includes Jessica Sylvia Clarno, Presley Dupuis, Piper Glover, Brandon Miller, Cassidy Tidwell, Jonathan Breitkreutz, Geoff Carr, Zach Johnston, Kelly Stagner, Logan Parks, Nate Sakwi, Travis Cook, Rick St. Martin, Annika Holmes, Brooklynn Freer, Rob Sprinkel, and Carrie Lasher. The stage manager is Riley Hess, who is assisted by Brooklynn Freer. The play is free and open to the public. No infants please.